During November–December 2006, a trial excavation was conducted at the site (Permit No. A-4953; map ref. 190201–22/707964–72), after mechanical equipment damaged ancient remains. 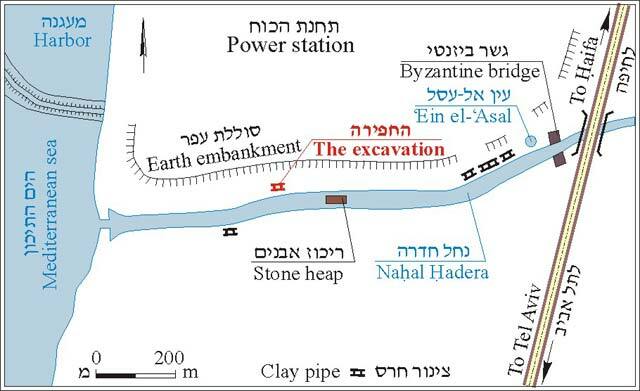 The excavation, undertaken on behalf of the Israel Antiquities Authority and underwritten by the Israel Natural Gas Lines Company Ltd., was directed by E. Oren and A. Masarwa, with the assistance of S. Ya‘aqov-Jam (administration), A. Hajian (surveying), S. Ben-Yehuda (drawing), C. Sari, M. Masarwa and E. Galili. The excavation area was located along the northern bank of Nahal Hadera, close to the Israel Electric Company’s Orot Rabin power station. The site had been surveyed in the past and various antiquities were documented, including an ancient road, a destroyed Byzantine bridge, building remains from the Hellenistic, Roman and Early Islamic periods and sections of an aqueduct composed of clay pipes (HA 45:13 [Hebrew]; ESI 20:38*; ‘Atiqot 10 [HS]:101–110). 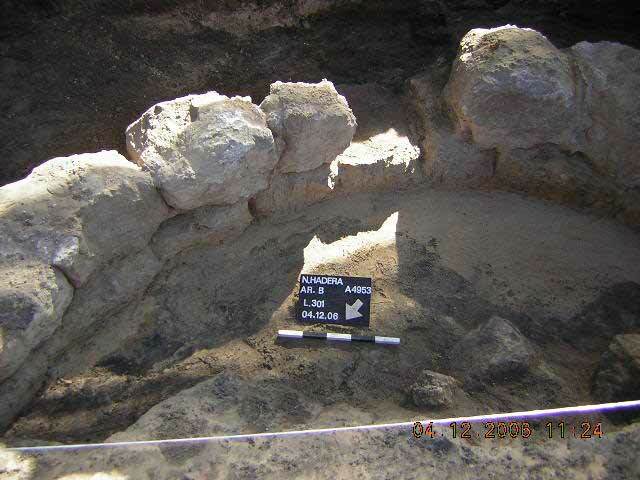 Two excavation areas (A, B) were opened; another section of the aqueduct and remains of a round building, whose function is unclear, were discovered. These remains were severely damaged when the power station was constructed. An excavation square was opened c. 500 m from the shoreline and a section of an aqueduct (length 5.5 m), oriented east–west, was unearthed (Fig. 2). 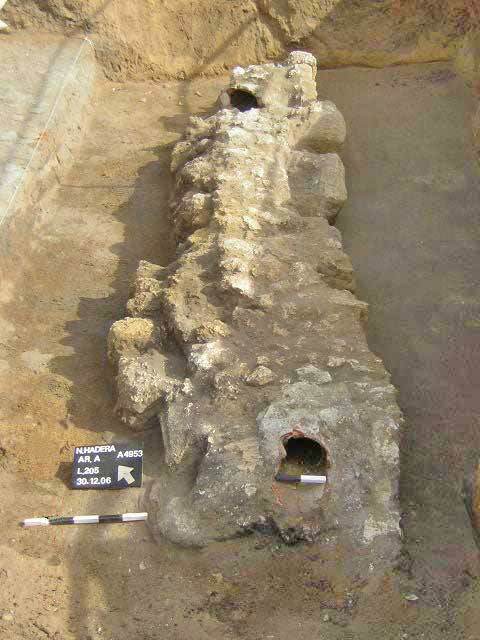 The aqueduct included a clay pipe composed of sections (diam. 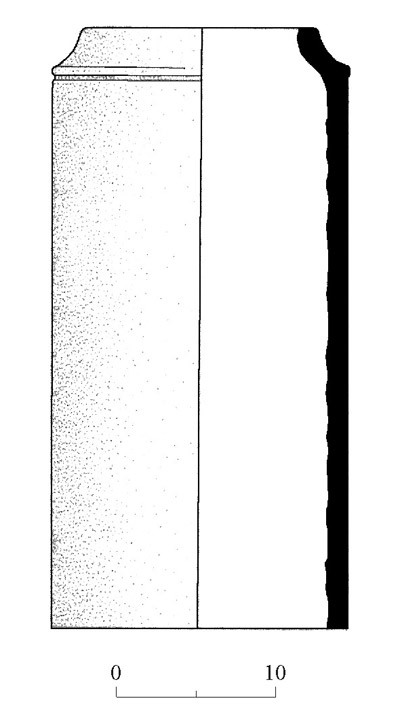 0.2 m; length 0.37 m; Fig. 3) that were set on the ground, covered with a casing of cement mixed with small fieldstones and sealed on both sides with different size fieldstones. A few fragments of pottery vessels that dated to the Roman and Byzantine periods were discovered. The aqueduct probably conveyed water from the el-‘Asal spring, which flows near the Byzantine bridge, to Caesarea or the adjacent farmland. The area (c. 24 sq m) was opened c. 20 m east of Area A. Remains of two curved walls (W10, W11; Fig. 4) were exposed. The walls, built of dressed kurkar stones (0.3 × 0.4 × 0.7 m) and preserved three courses high, were separated by an opening (L30; width 0.6 m). Potsherds dating mostly to the Roman period were collected. The walls were probably part of a building, whose function is unclear; however it was probably connected to the ancient road that passed close by. Due to its condition and the modern disturbances caused to the excavation area, it could not be expanded northward to evaluate the nature and extent of the remains. 2. The aqueduct, looking northeast. 4. Curved wall, looking southeast.